If there is a specific date by which you must receive your order, please indicate this in the comments section. We will do our best to accommodate your request. The total weight of your order determines the method of shipment. 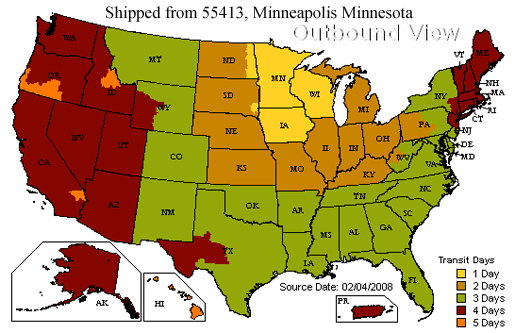 Most orders are shipped UPS Ground or US Mail. If you experience delivery problems with either of these shipping methods, please indicate this information in the comments section. Automated shipping estimates are not calculated or shown for orders greater than 200 lbs. This does not imply free shipping. Common carrier truck is normally used for 350 lbs. and over. We will check for the most economical means of shipment and email you for approval. Our website automatically interfaces with UPS' rating system. Upon checkout you are able to view your ESTIMATED UPS ground shipment charges. 2nd Day Air and 3 Day Select Services are also available. We work with a wide range of common carriers that offer service to almost all points in the continental US, Hawaii, Alaska, Puerto Rico, US Virgin Islands, Canada and Mexico. We are also able to rate and ship most orders worldwide. We have generous discount contracts with the carriers we use. We ship all orders "prepaid and add", no additional or accessorial charges are due upon delivery. When a shipment is destined to a private party or residence, a "residential delivery" charge of approx. $30-$40 is sometimes assessed. If this is the case we will email you and charge your account accordingly. Residential delivery fees can be avoided if you have a shipment delivered on your behalf to a local business or entity that is able to more conveniently handle a large shipment. With all common carrier truck shipments, it is the driver's job to get the shipment to the back of the truck for off-loading. It is important that you be helpful and participate in getting your shipment off the truck. In some areas, lift gate trucks are available. A $35 to $75 lift gate charge is applicable in addition to a slight delay for coordinating the availability of equipment. FOB refers to a location from which an item would typically be drop shipped. Freight charges are applied from the FOB city and state to your city and state. An exception would be equipment from those locations that we have in stock at our Minneapolis, MN warehouse and elect to ship directly to you. When we bring in large orders of equipment the inbound freight is always less. We will calculate if it is more reasonable to drop ship equipment directly to you or ship the item from our stock. Please call us if you have additional questions about shipping your order that are not answered here.